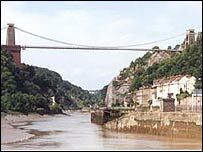 A public inquiry into the proposed toll rise at Clifton Suspension Bridge has ended, with a final report expected in weeks and a decision in months. Several objections were noted against plans for a rise in the toll for cars from 30p to 50p. The bridge trustees say the rise is needed because of increased insurance charges, the cost of new lighting and the discovery of voids under one tower. The National Alliance Against Tolls opposes the plans. It says the trust - which made a £600,000 loss last year - has reserves of £6.5m. "In our view the case put forward by the trust was out of date and inconsistent", said John McGoldrick, from the Alliance.